According to the U.S. Bureau of Labor Statistics, the healthcare administration industry is projected to grow 17% from 2014 to 2024, and the fields of private health practice, nursing home care, and electronic health records (EHRs) are expected to be in highest demand. As medical technologies advance, services that were once provided solely in hospitals will become available in the offices of health practitioners and medical groups. Nursing facilities will meanwhile see a rise in patients as baby boomers enter their golden years, requiring increased nursing staff and, in turn, a demand for healthcare administrators. The national demand for paperless records in the form of EHRs also means that administrators with knowledge of health informatics will find ample job opportunities post-graduation. Professionals who excel in this career are able to lead effectively and adapt quickly, as health laws, regulations, and technology are constantly changing. A large part of a healthcare administrator's job is recruiting, training, and managing staff, so strong interpersonal skills and a knack for managing tasks is crucial. Choosing to pursue a healthcare administration degree online allows a flexible schedule for working individuals entering the growing field. An associate degree in healthcare administration is a good starting point for aspiring professionals seeking entry-level positions, particularly in the administrative and clerical sectors. Earning a bachelor's-level healthcare administration degree online or on-campus provides a stronger foundation for a career in the field, along with the specializations needed to be competitive in the job market. A healthcare administration master's degree online is typically the next step for aspiring professionals. This program requires two to three years, and applicants must hold an undergraduate degree. Coursework includes advanced topics like healthcare policy and law and organizational behavior. One year of supervised administrative experience in a hospital or healthcare consulting setting is also usually required. The average cost of a master's degree is around $2,000 more than a bachelor's, and professionals who hold this degree typically see a 33% rise in their salary along with further reduction in average loan default rate. A doctorate is the last step in major accreditation, and professionals who earn this healthcare administration online degree can go on to land chief positions or teach at the university level. Individuals just starting out in the field of healthcare administration and wishing to pursue a clerical route may find an associate's degree a suitable option. An online healthcare administration degree at this level usually takes 1-2 years to complete and costs roughly $14,900. The average income for this degree type is $28,400. A majority of associate degree-holders go on to pursue a bachelor's in healthcare administration degree online, as many employers require it for job placement. Pitt, located in Winterville, North Carolina, educates and empowers students by making their programs and services accessible to all students. They have expanded their accessibility through their online programs, offering 10 degrees and various certificates. Online resources include a mandatory orientation, access to PCC library online, an online tutoring service, and more. The school’s online programs include an associate degree in healthcare administration that focuses on the necessity of planning, directing, and controlling tasks to achieve the healthcare organizational objectives. It requires students to earn 73 credits in courses like payroll accounting, managerial accounting, law, and public speaking. Students who graduate from this online healthcare management technology program have the knowledge and accreditation to become successful in the healthcare management industry. Graduates are prepared for careers as cash management coordinator, patient financial counselor, patient accounts supervisor, and more. Minnesota West serves a diverse population with varied educational needs in an affordable, accessible, and supportive setting. Their online program provides flexibility and convenience for learners by allowing students to create their own schedule. The courses are offered through Desire2Learn Brightspace, an easy-to-use platform where courses are designed uniformly to ensure a smooth experience for all distance learners. Minnesota West’s healthcare administration degree online gives current healthcare workers the knowledge to pursue a management position while continuing to work. Sixty credits must be earned in classes like corporate compliance, leadership, and employment. Students will graduate with an associate of science degree in management and supervision in healthcare and will have the option to transfer to a four-year university. Online learners are also encouraged to use Smarthinking, an online tutoring service, which assists students in math, economics, accounting, and more. Students can also get feedback on writing assignments. Florida Tech, located in Melbourne, houses thousands of students each year and is home to The Scott Center for Autism Treatment. The center has undergraduate and graduate students work with children with autism and other related disorders to become specialists. Online courses are presented in eight-week terms and are designed to have students interact with peers and faculty through discussion boards and live chat. FIT’s online associate degree in healthcare administration provides students with instruction in areas of the healthcare industry, including healthcare organizations, managed care and medical ethics, and a range of business disciplines. Distance learners must earn at least 64 credits in classes like physical science, biological science, and accounting. Graduates are prepared for entry-level careers in the industry and have the opportunity to continue their education and earn a bachelor of arts in business administration – healthcare management. St. Petersburg’s eCampus offers more than 650 online courses and dozens of degrees to more than 20,000 students each year. Distance learners are welcome to visit the Clearwater, Florida, campus and use the wellness center, visit the Crossroads Gallery, or eat at the Hard Drive Café. The online associate of science degree in health sciences includes an embedded certificate in health care services. The certificate is earned after completing 32 credits of required courses. The program has 10 specializations, including dental hygiene, emergency medical services, general health, and health information technology. Each specialization is around 60 credits and has students complete general education, support, and major courses. Graduates are prepared for careers as medical and health services managers, medical office specialists, nutrition services managers, mental health program managers, and more. Students can access various resources online, including advising, financial aid, library online, and a technical help desk. Wayne strives to be a catalyst for economic development, social equity, and personal enrichment by enabling individuals and responding quickly to the training needs of local businesses and industries. Unique to the school is their Wayne Business and Industry Center located on campus in Goldsboro, North Carolina. It’s a place for local companies to conduct business and employer training. WCU also offers online programs where students can earn various degrees or certificates, including a healthcare administration degree online. This program teaches students how to perform a wide array of administrative duties and prepares them for employment in medical settings like hospitals, clinics, medical offices, and insurance companies. The associate of applied science degree in medical office administration requires students to earn 68-69 credits in courses like procedure coding, diagnostic coding, professional development, and medical law and ethics. Concordia embodies and upholds their mission to develop each student’s mind, body, and spirit in every class, including online. The school offers more than 50 online degrees, including an associate of healthcare management degree. The program prepares students to enter the workforce. Throughout the program students are assigned an online student success advisor who personally assists them throughout all stages of their education. Distance learners must earn at least 64 credits in courses like health care ethics, financial issues, human resources management, and strategic healthcare planning and evaluation. Graduates are prepared for careers as medical records coordinators, nurse managers, nursing home administrators, and ambulatory care center managers. A health care practicum is required. The practicum has students earn on-the-job training. Students keep a journal while completing the practicum and turn in a research paper. Learners who want to sit for the State of Wisconsin Nursing Home Administrator exam must complete their practicum in a nursing home setting. Fayetteville Tech offers more than 200 associate degrees, diplomas, and certificates; many are also offered completely online. The healthcare administration degree online provides students with the knowledge to apply management principles in a healthcare setting. The associate degree in healthcare management technology can be earned in five semesters and requires students to earn at least 65 credits. Courses include management of healthcare organizations, medical insurance, human resource management, and public speaking. Graduates are eligible to sit for the Certified Patient Account Manager and the Certified Manager of Patient Accounts exams. Student resources include the Student Learning Center, counseling services, and more. Military training can be converted into class credits reducing the time it takes to complete a degree. Applicants must hold a high school diploma and have at least one unit of algebra. Graduates are prepared for careers in hospitals, clinics, insurance companies, and more. Ultimate Medical Academy is a nonprofit school that was founded in 1994 as a healthcare educational institution. The school created Ultimate Student Services to help students overcome academic obstacles. Services include financial aid assistance, academic coaching, one-on-one tutoring, learning resources, 24/7 technical support, a personal advisor, and alumni services. Programs at Ultimate Medical include an online associate degree in healthcare administration. This program trains students to apply learned skills to different healthcare settings, such as medical billing systems or preparing budgets. The degree can be earned in 17 months. The program requires students to earn at least 66 credits; students from Arkansas must earn 69. Courses include intro to leadership and management, practice structure and enhancement, medical terminology, and accounting. Students complete 52 credits of major courses and 15 in general education. Graduates are prepared for careers as front desk supervisors, medical office specialists, and more. Lanier Tech provides students with an affordable and practical education. The school supports local economic growth by being a major resource for the surrounding county’s workforce development. LTC offers various degree programs online, including an online associate degree in healthcare administration. The health care administration program allows students already working in the industry to obtain their associate degree in healthcare management technology within 6 semesters, positioning them for managerial advancement. Learners must earn at least 73 credits in courses like anatomy, healthcare statistics, medical coding, and medical records and systems management. The program emphasizes the skills necessary to achieve healthcare organization objectives, specifically in the ethical and legal environment. Students have access to resources like tutoring, online orientation and tutorials, and an assigned advisor. Students are encouraged to use the career placement services to help them find a career. Community Care is a nonprofit, private institution located in Tulsa, Oklahoma. The school is dedicated to helping students reach their career goals. Community Care’s online programs offer flexibility with the opportunity to create your own schedule. The college’s career and life development course helps students develop good learning habits. The development courses also teach students academic and career skills. Students can earn a healthcare administration degree online. The program teaches core competencies of the health care administration field while developing critical skills in scheduling, data entry, and insurance. Courses include medical law and ethics, medical terminology, diagnostic coding, and healthcare management. This program is structured with online lectures and a virtual internship experience to prepare students to succeed in a medical office setting. The program can be completed in eight months. Graduates are prepared for managerial positions. Oklahoma State offers a variety of online associate degrees, including an online associate degree in healthcare administration. Students gain the skills and knowledge necessary of a healthcare administrator. Learners must earn at least 64 credits. Courses include health care provider relationships, health care management, business law and ethics, and medical terminology. Student services include the Student Success and Opportunity Center, where students can receive tutoring, attend study skills workshops, find one-minute study tips, and utilize the computer lab. The university has delegated an entire office to focus on student development, with the objective to aid in improving the overall student experience. Graduates are prepared for careers in sales and marketing, office management, customer care, and hospital administration. At least 15 credits must be earned on-campus, and students must maintain a 2.0 GPA or higher. Thirty-seven credits are general education requirements. Colorado Christian is a private university known as the flagship interdenominational Christian university in the Rocky Mountains. CCU offers many of their degrees through on-campus classes or online. Online students take one, five-week course at a time, each taught from a Christian worldview. CCU’s healthcare administration degree online is designed for busy adult learners. Students must earn at least 60 credits, including 18 major, 36 general education, and six elective credits. The program gives students the knowledge necessary to make important decisions about patients and educates them in the field of human resources. Courses include health care terminology, healthcare informatics, human anatomy, and health care law. The degree can be earned in two years or less. CCU provides each student with a Life Directions advisor who offers students academic, career, and spiritual guidance. Students must earn a “D” or better in all courses, and graduates must have a cumulative GPA of 2.0. Iowa Central, located in Fort Dodge, Iowa, offers a two-year, online associate degree in healthcare administration. Courses are taught in an eight-week format. The program is designed for entry-level employees and health care professionals. Students must earn at least 66 credits, and the program is usually completed in two years. Students who graduate with an associate of professional studies in health care administration degree are prepared to become health profession managers. Courses cover the topics of economics, management, accounting, and the aging population. Iowa Central provides students with an Academic Resource Center that is an educational support service providing in person tutoring, online tutoring, proofreading, and a writing center. The program is accredited by the Higher Learning Commission. Bossier Parish, located in northwest Louisiana, empowers the regional workforce by creating programs that align with regional employment sectors. BPCC created an online program that allows working students to earn a degree. They offer an associate of science in health care management degree online with two concentrations: professional practice and health studies. The professional practice concentration is designed for students seeking immediate employment. The health studies concentration is designed for students planning to apply to a baccalaureate program. Both concentrations provide students with necessary information to succeed in the healthcare industry such as, applying management theory to real world situations and the knowledge to work with the technology used in the industry. Students must earn at least 60 credits in courses like basic statistics, healthcare law, risk and insurance, and supervision. The professional practice concentration requires distance learners to complete an internship. Students have access to a personal advisor, writing center, online tutoring services, and career services. Guilford Tech serves more than 40,000 students from its campuses around North Carolina; the main campus is located in Jamestown. Student services include academic advising, career services, financial aid, a student success center, online and in person tutoring, and 24/7 technical assistance. GTCC offers an associate of applied science in healthcare administration. The curriculum teaches students the knowledge necessary for employment in the business operations sector of healthcare. Courses include professional development, healthcare financial management, office editing, and human resource management. Students must earn at least 68 credits, including general education courses and science, math, humanities, and communication electives. Graduates are prepared for a variety of healthcare environments, including dental offices, hospitals, insurance companies, and medical supply companies. Students learn about many software packages and financial management tasks. Graduates will also be able to understand medical terminology. A bachelor's degree offers a more solid foundation for those wishing to enter the field of healthcare administration. Students who pursue a healthcare administration online degree at this level learn business fundamentals while also picking up specialities that will help them to navigate technology, interact with people, and understand and control resources efficiently in healthcare facilities. Depending on the program, internships or a capstone project is required for graduation. Many students at this level continue on to earn a healthcare administration master's degree online. 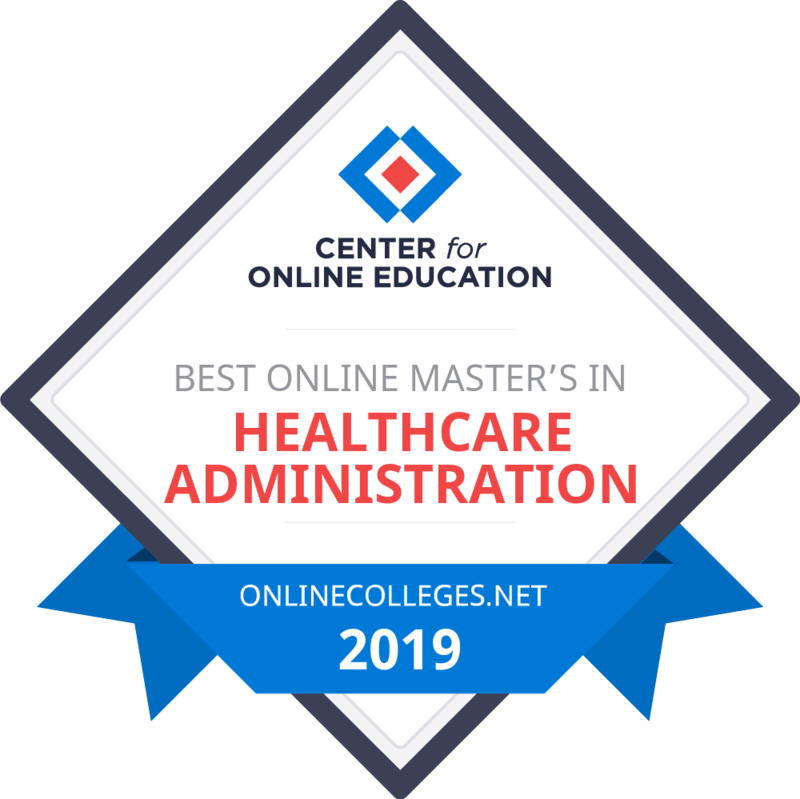 Most healthcare administration master's degree online programs award the master of healthcare administration (MHA) or master of business administration in healthcare administration (MBA/HCA). This type of degree is geared towards professionals looking to improve their skills within the medical and healthcare administration field. Many of the top employers require a master's as a minimum education level, and the completion of a healthcare administration master's degree online or on-campus is contingent on fulfilling internship and research project requirements in addition to passing the curriculum. The mission of the online master's in healthcare administration at the University of North Carolina at Chapel Hill is to promote the leadership skills of early and midcareer professionals wishing to manage health care systems. Graduates from the master’s in healthcare administration work in hospitals, consulting firms, managed care organizations, insurance firms, NGOs, medical group practices, and government agencies. The curriculum offered by UNC Chapel Hill is consistently ranked among the top three programs of its kind by U.S. News & World Report and Modern Healthcare. Located in the Pacific Northwest, Oregon Health & Science University (OHSU) is one of the only schools to offer a business-centric approach to health care administration. The online master of science in health care administration program is home to an experienced faculty who, along with a dedicated student body, pursue the improvement of quality, accessibility, and cost-effectiveness of the U.S. healthcare system. Most courses within the curriculum are offered online, though students are required to attend two on-campus classes per semester. The MS in health care management provides graduates with the skills to lead teams, develop processes, and ideate strategies for optimized health care implementation. At George Washington University (GWU), students can choose between two online master’s in healthcare administration. The MS in health informatics serves professionals who have at least three years of experience in healthcare, data analytics, or IT. Students develop business skills and professionalism, and the practical knowledge to create change in the health care system and patient outcomes. The MS in management of health Informatics and analytics program develops leaders who have the necessary values, knowledge, and skills to optimize healthcare delivery. GWU emphasizes the value of experiential learning and community service, and programs are backed by expert faculty, research collaborations, and longstanding relationships with policymakers and healthcare organizations in Washington, D.C. The University of Southern California employs a “value-based and outcomes-oriented approach” to health care management in their online master’s in healthcare administration. The curriculum centers on health care innovation and implementation, including population management, risk assessment, and access. Students discover new channels for creating transparency, establishing partnerships among organizations and patients, and developing a qualified workforce. The program redefines global health care policy by examining societal health, regulatory issues, and organization evolution. The online master of health care administration can be completed in two years through a flexible program directed toward working, experienced health care leadership professionals. Located just outside New York City, New York Medical College (NYMC) has graduated leaders in public health since 1860. The master's in public health with a concentration in health policy and management explores the complex structures of health care delivery in the US, including its legal and ethical foundations. The experienced faculty possess backgrounds as practitioners and leading thinkers in health related positions, and they prepare graduates for careers ranging from government health agencies to private managed care systems. The 46 credit program can be completed in person, online, or as a hybrid. Des Moines University develops health professionals who demonstrate a commitment to health, the pursuit of knowledge, and service to the community. With an online master of healthcare administration, students learn the critical components of a successful healthcare organization, including financial management, health information management, leadership development, and health policy. Des Moines University’s master's in healthcare administration online is developed for working professionals, with 75% of program participants employed full-time while earning their degree. Most classes are completed online, though students are required to attend three five-day immersion experiences on campus. Full-time and part-time options are available. Mississippi College (MC) is a private Christian liberal arts university dedicated to academic excellence and advancing the cause of Christ. The online master in healthcare administration is designed to meet the needs of modern health care professionals in the local community and around the globe. Coursework sketches the conceptual and practical frameworks required to succeed in the field, and classes on research, financial management, organizational behavior, and ethics prepare graduates to manage all aspects of a complex health care system. This master’s program at MC is offered fully online, with evening classes available to accommodate the responsibilities of working adults. The University of Illinois at Chicago’s School of Public Health, in collaboration with the College of Business Administration, offers a two year master's of healthcare administration online. The program is designed for students who wish to pursue management careers in hospitals, clinics, health supply companies, or private managed care organizations. Graduates leave with general management skills and an understanding of the unique challenges facing the healthcare sector. Curriculum within the online master of health care administration program emphasizes accounting, economics, and finance; and a preceptorship provides students with practical grounding. The 60 credit program also requires a capstone project. The master's in healthcare administration program at Oklahoma State University Center for Health Sciences was founded in 1969. Since then, graduates have gone on to hold important leadership positions around the U.S. and around the globe. The master’s in healthcare administration online prepares students for successful management careers across a breadth of healthcare settings, including hospitals, clinics, consulting, insurance, and government agencies. The curriculum combines rigorous academic instruction with practical, hands-on experiences. Graduates pursue change within the United States healthcare system, and become leaders poised to impact the future of the field. The College of Public Health’s MHA program is ranked 10th nationally by U.S. News & World Report, and job placement for Oklahoma State University students is more than 95% by the time of graduation. Based in Fort Wayne, IN, the University of St. Francis is a Catholic university committed to the application of Franciscan ethics and values in every program. The online master’s in healthcare administration program is built with working professionals in mind, and with the goal of helping early- and mid-career administrators broaden their knowledge and understanding of the healthcare field. The online format of the program is rigorous, convenient, and flexible, and the curriculum combines management theory with practical application, providing students with sound administrative skills through critical evaluation of literature and data. Additionally, graduates leave with confidence to succeed and adjust in an ever-shifting health care market. The content of online courses -- and all assignments and requirements -- are the same as on-campus courses. Online students interact with program faculty on a regular basis, all of whom have specialized training to offer meaningful and challenging online course experiences. Situated in the historic Fenway neighborhood of Boston, MA, Simmons College is a liberal arts institution named a “Best College” by US News and World Report. The online master of business administration in healthcare is designed for working professionals within the healthcare sector, and prepares graduates to advance in leadership and management positions within their organizations and throughout the healthcare industry. The [email protected] mixes traditional MBA coursework with an extensive health management curriculum, while courses in business foundations and industry-focused case studies develop students’ critical thinking skills. The 50-credit program can be completed mostly online, with two in-person “immersions” required. Full-time students can complete their MBA in healthcare in 24 months. Originating in 1912 as the Chicago Hospital - College of Medicine, today Rosalind Franklin University (RFU) is home to five colleges with over 30 graduate health and science programs. The master of science in health administration (MS) emphasizes an interprofessional pedagogy and provides students hands-on experiences to prepare them for management and leadership careers in health care. The master of science in health administration curriculum provides opportunities for students to learn together with others across health care fields, sharing skills and professional knowledge. Graduates are prepared to oversee financial matters, regulatory and legal compliance, human resource functions, facilities, and technology in healthcare-related businesses. Based in Orlando, FL, the University of Central Florida is one of the largest research universities in the U.S. The school features ten regional campuses throughout Florida and a robust online presence, meaning its 64,000 students benefit from leading research and a diverse faculty. The master’s program in health services administration one of only 70 programs worldwide fully accredited by the Commission of Accreditation of Healthcare Management Education (CAHME), and suits recent graduate and mid-career professionals who want to advance and lead in health care. Students in the online master of health care administration program analyze issues and trends in health care. They study leadership structures in the field and create strategic, financial, and organizational change plans; research methods and statistics; and create information systems for solving the industry’s most pressing issues. Additionally, coursework emphasizes communications and teamwork within healthcare organizations. Friends University, a Wichita, KS-based Christian university in the Quaker tradition, prepares students to honor God and serve others by integrating their intellectual, spiritual, and professional lives. The online master’s in healthcare administration prepares graduates to carry this ethos into leadership positions throughout the healthcare field. Coursework is led by professionals in the industry and covers all phases of healthcare leadership, including acute care, long-term care, clinic management, home health and hospice agencies, and hospital management. The curriculum is taught by faculty with vast experiences in the industry, and ensures that graduates leave prepared to take on the challenges of the modern health care field. The degree accommodates professionals looking to rise to leadership positions, and students can choose from a CEO or director career track. The master’s in healthcare administration online from Central Michigan University prepares students for senior leadership positions in health care. With an emphasis on critical thinking and strategic operations, graduates leave ready to be leaders in the healthcare industry. Coursework provides health care-related perspectives on finance, marketing, economics, planning, population health, quantitative methods, and management. Graduates assume roles as senior level members in hospital administration, nursing home CEOs, group practice managers, senior department managers, and in many other positions. The 51-credit program is available fully online, and CMU’s faculty and staff work with students to accommodate busy schedules and ensure each student has a smooth academic journey, with many support resources and services available. Students who have no prior experience in the healthcare industry are required to participate in an internship. Pfeiffer University’s joint MHA/MBA program combines the most important pieces of each the master of business administration and master of health administration programs into a joint, intensive degree program. Designed for experienced clinicians and healthcare leaders, the MHA/MBA develops advanced competencies in qualitative and quantitative aspects of management, and offers traditional MBA courses with a practical health care focus. While the program’s format is primarily online, students can participate in an eight-to-ten day international study in Europe, the United Kingdom, or Canada under supervision of Pfeiffer's faculty. Roberts Wesleyan College is a Christian institution dedicated to the education of the whole person. The online health administration M.S. embraces this philosophy by offering clinical and non-clinical health care professionals a community service focus to their education, and prepares them to assume leadership roles in health care organizations. This online master’s degree represents a modern blend of health administration and business coursework, and graduates leave prepared for roles as residential managers, sonographers, staff therapists, and chief administrative officers, among others. The curriculum of this online master’s degree develops the theoretical foundations of health care leadership, emphasizes servant leadership in health care systems, and promotes service to the community through personal values and leadership activity. Students are grouped together in a cohort throughout the program, and they take only one course at a time to maximize learning. Based in Winona, MN, St. Mary’s University of Minnesota is a private, Catholic university devoted to ethical service and leadership. The master of arts in health and human services administration online extends this vision and prepares students with practical and theoretical knowledge to be leaders in this field. The program is designed for new and seasoned professionals, and governs general management, financial management, and health and long-term care administration. Graduates often assume roles in hospitals, clinics, long-term care centers, nursing homes, government agencies, nonprofits, and clinics. Licensure may also available for students who participate in available practicums. This online master of arts in health and human services administration can be earned in as little as two years, and the program starts six times per year. The online master of healthcare administration at Seton Hall University prepares graduates to take on leadership and management positions in today’s complex healthcare environment. The 42-credit program represents the only MHA in New Jersey accredited by the Commission on Accreditation of Healthcare Management Education. The university’s location allows students to forge connections within the pharmaceutical and biotechnical corridor of New York. The curriculum in this online master of healthcare administration is revised yearly based on student feedback and current industry trends, and the school’s Catholic tradition promotes the values of servant leadership and professionalism. Online students participate in a cohort throughout their time, and are required to attend three, five-day intensives on-campus during their program. Situated in the shadows of the Rocky Mountains, the University of Denver (DU) is a private liberal arts institution offering more than 120 graduate degrees. The online global health program management master’s prepares students to compete in today’s healthcare environment as they learn techniques for implementing quality, affordable health care. In this online master’s degree program, students evaluate the limitations of existing health care systems, and ways to transform those environments through leadership, policy, technology, and fresh perspectives. Students apply their learned skills to real-world scenarios through practice based curriculum, and graduate qualified to take on leadership roles within the healthcare field. The 48 credit program is customizable to students’ individual career plans, and offers access to DU’s Career Services center to assist with post-graduate employment. An online master’s degree in healthcare administration from Texas Woman’s University prepares students for roles as administrators and staff specialists in health care institutions. The program’s focus on business management, health facility organization, strategic planning, and decision making trains students to manage the complexities of today’s health care systems. TWU’s health care administration program has been ranked as the 11th most affordable HCA program in the country, and is accredited by the Commision on Accreditation of healthcare Management Education. The curriculum of this master’s degree is tailored to working healthcare professionals and adults seeking to enter the healthcare field, where students can work on the degree part-time. Additionally, TWU students benefit from the school’s location in the Texas Medical Center, where they can work and learn from one of the largest medical care environments in the world. With campuses throughout Europe, South America, the Upper Midwest, and online, the University of Mary is private Christian Catholic Benedictine university with a truly global reach. In the dual MSN/MBA degree, graduates are trained to be nursing leaders and effective, ethical decision makers. Coursework covers business, administrative, and clinical area, while a capstone project and 500 hours of practical leadership experience prepare students to integrate theory and practice in specific contexts. Faculty are recognized as leaders in their fields of study, and academic advisors are available to all students for extra support on all academic matters. This online master’s degree in health care administration is comprised of adult student peers, and the university places significant value on team support for success in the program and graduates’ careers. The online master of science in healthcare administration at Cal State East Bay helps students develop the analytical skills and knowledge they need to explore innovative healthcare delivery models and organizational strategies. Students build leadership skills to understand, create, and implement solutions for the problems facing the healthcare system today. The online program is convenient and flexible for working adults, and delivers the dynamic education students receive on campus. The program is delivered on a quarter system, making it possible for students to accelerate their degree by taking six consecutive quarters, and complete the program in a year and a half. Online students enjoy a highly personalized learning experience, taught by faculty who are proven experts in their field. Graduates with an MS in health care administration leave with the skills they need to work in hospitals, ambulatory healthcare services, group medical practices, nursing and residential care facilities, government agencies, and more. With campuses throughout Delaware, New Jersey, Maryland, and a robust online presence, Wilmington University strives to make education accessible to people at all stages in life. The online master’s in business administration with a healthcare concentration is a rigorous program designed to accommodate the schedules of working professionals, and prepares graduates to succeed in a fast-paced health care industry. The curriculum of this online master’s begins with traditional MBA courses in accounting, finance, strategy, and more. Students then proceed to specialized coursework in health care administration, with topics like health policy and economics, insurance and reimbursement, and legal/marketing perspectives in health care. Wilmington offers several ways to complete coursework, from a fully online option to a hybrid format. Classes meet in either 15-week semesters or seven-week blocks, and are facilitated through Blackboard. Ohio University is the ninth oldest public university in the country, with over 35,000 students taking classes on campus or online. The online master of health administration leans on expert faculty to provide students the leadership skills they’ll need to make effective decisions in a complex, rapidly-growing healthcare industry. Delivered fully online and with flexible options for working adults, the master’s in health administration offers relevant and collaborative coursework that can be applied to real-world issues. Classes in health care ethics, law, finance, policy, and leadership give students a broad understanding of the industry. Students take 12, seven-week courses and can complete their degree in as little as two years while taking one course at a time. This degree path is necessary for those looking to land advanced roles in health administration, particularly in the sectors of research, policy, and higher education. Through rigorous coursework, hands-on experience, and the writing of a extensive dissertation, candidates who complete this healthcare administration degree online or on-campus learn to become innovative leaders within the healthcare industry. By combining theory and practice, the curriculum of this advanced degree provides students with the well-rounded knowledge needed to transition into a variety of potential careers where they might improve and influence the field. A health insurance specialist's main function is to ensure the proper conduct and application of plan benefits, and occasionally work with insurance companies to edit current benefits and create new ones. This position requires knowledge of medical records, coding, billing, and extensive and up-to-date understanding of the American insurance system. Those with excellent oral and verbal skills are well suited for this position, as it requires communication between patients, health facilities, and insurance companies. Professionals must also be able to make difficult insurance parlance and coding languages understandable to any of the groups above. While this field calls for a high school degree as a minimum education requirement, those who earn a healthcare administration online degree will have a leg-up in the job search. Health education specialists must have earned a bachelor's-level healthcare administration degree online or on-campus. These professionals assess the needs of people in their community and design programs and events that will provide them with resources for healthier living. The role requires leadership and organizational skills along with knowledge of biological and socio-cultural factors that impact individual health. Health education specialists should be empathetic and have experience in community development and service. This is not a desk job, and professionals should prepare to be out in the field affecting change. Health information specialists organize and manage medical data and records. With the increased use of EHRs in the field, an information specialist must have extensive and current knowledge of databases and coding languages. Individuals with excellent organizational skills and the ability to assess large amounts of data are best suited for this job. Public health social workers help clients in needy communities to understand, deal with, and overcome challenging situations, such as the adoption of a child, the diagnosis of a serious illness, mental health issues, and substance abuse. Social workers find people who need help, assess their situation, and work intimately with them and their community to create a plan to improve overall wellbeing. The position requires exceptional people skills due to the vulnerable and sometimes unpredictable nature of clients. These professionals should also be able to work well under stressful settings, as social workers are sometimes asked to deal with crisis situations such as child abuse or natural disasters. Managers lead the operation of various types of healthcare facilities, overseeing specific departments or the entire program. General job duties include serving as liaisons between administrators and medical staff, maintaining records, training and managing employees, and ensuring proper billing and insurance filings. Effective managers should be able discern task importance and delegate work, skills which can be learned when pursuing an online healthcare administration degree. They should also be strong collaborators, as they often deal with medical staff, their own staff, insurance companies, and patients. The cHAP exam is designed for administrative professions working in hospitals or other healthcare provider organizations, and those who achieve the distinction are among the elite in their field in terms of experience, training, and continuing education. In order to be eligible for the exam, applicants must satisfy one of the following criteria: (1) have five or more consecutive years of work experience and hold a bachelor's degree or higher, (2) have been or is currently a member of cHAP, or (3) accrue 100 points from a list of requirements. Application and exam fees cost $250 and $125, respectively ($150 and $75 for cHAP members). The exam consists of multiple-choice, true/false, and fill-in-the-blank questions on five areas of administrative expertise: clerical, grammar, healthcare governance, healthcare regulatory, and software. The exam is designed for healthcare administrators, particularly managers, interested in distinguishing themselves in the areas of patient financial services and the revenue cycle. There are five different AAHAM exams, designed for people at different stages in their career. The Certified Revenue Cycle Executive ($299) is an eight-hour proctored exam focusing on topics such as patient access and credit/collections. The Certified Revenue Cycle Professional ($199) is a four-hour exam consisting of multiple-choice and true/false questions on revenue cycle. The Certified Revenue Integrity Professional ($199) is a four-hour exam that measures basic competencies in healthcare compliance. The Certified Revenue Cycle Specialist ($100) takes two hours, and tests working knowledge of the revenue cycle. Last, the Certified Compliance Technician ($100) lasts 90 minutes and measures basic competencies in healthcare compliance. The premier credential for healthcare managers, this exam is only open to those with at least two years of experience in the field. Applicants must also hold a master's or other advanced degree, and should be in a healthcare management position. Thirty-six hours of healthcare management continuing education is required, 12 of which must be ACHE face-to face education credits. The exam itself costs $250, though a $200 waiver is available. The certification exam includes 230 multiple-choice questions, 30 of which are pretest questions. Content is drawn from 10 knowledge areas, ranging from governance and organizational structure, to finance and management. ACHE fellows are among the best in the field, and the distinction comes with organizational resources and high change for better salaries.